James Winter loved teaching. In addition to horn, he taught music theory, history, conducting, brass instruments, and brass pedagogy, and he always saw music in a broad context. He helped steer the IHS in the early years as editor. As president, he started the composition contest and oversaw the first international symposium in Detmold, Germany. In personality, he was warm and witty, with an engaging way of conveying musical concepts. Jim was born in 1919 in Minneapolis. His family moved several times during his youth, but Jim fortunately had good music teachers. He started on cornet in sixth grade and moved to mellophone in seventh grade and horn in his junior year in Kansas City, where he had group horn lessons with Philip Farkas. He attended Carleton College (Northfield MN, near Minneapolis), where he eventually decided to make a career of teaching. He studied horn with J. Harris Mitchell, and also with William Muelbe of the Minneapolis Symphony. Jim served in the US Navy in the Pacific Theater from 1942-1946 on combat duty. Afterwards, he earned a master's degree in music history, literature, and musicology at Northwestern University, where he studied horn with Max Pottag. He was encouraged to play horn professionally, but he was intent on a teaching career. Jim accepted a teaching position at Fresno State College in 1947 and stayed for 40 years, rising from instructor to professor and through two administrative stints to Outstanding Professor and the University's Grand Marshall. From 1948-1968, he led the brass program; the brass choir was the outstanding ensemble of its kind on the West Coast and the students comprised "the sturdy anchor" of the Fresno Philharmonic during those years. Many students attended Fresno State (now California State University at Fresno) in order to study with Jim. His students included David Bakkegard (Baltimore) and David Krehbiel (San Francisco, also an IHS Honorary Member). Jim considered his students "'my' students in a very real sense" and took pride in the memory of them and their accomplishments, not only as horn players, but in many professions. 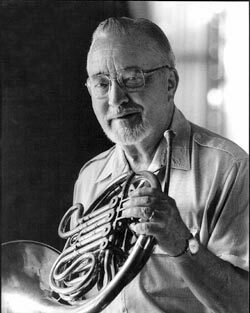 In 1954, Jim took a leave of absence to earn a PhD in composition (Philip Geeley Clapp and Philip Bezanson), brass pedagogy, and philosophy at the University of Iowa. His compositions include Suite for a Quartet of Young Horns and Canon for Two Horns. Jim's playing career included principal horn of the Fresno Philharmonic from 1954 and assistant conductor from 1980 to 1997, principal horn of the American Symphony Orchestra League West Coast Workshop Orchestra for ten years, principal horn and soloist of Music from Bear Valley (1970-1982), and hornist with the California Woodwind Quintet. Jim was an active editor and author. He was horn editor of Woodwind World for ten years and brass editor of the NACWPI Journal for five years. In addition to many articles in The Horn Call and The Instrumentalist, he published a brass method, The Brass Instruments (Alyn & Bacon). Jim played Geyer horns and often took an extra horn to engagements in case someone else's horn malfunctioned. He advocated using the F side up to C in the treble staff, and in later years warmed up on a Schmidt single F horn. Jim's support of the IHS is inestimable. He was Editor of The Horn Call (1972-1976), IHS Advisory Council member (1972-1976 and 1981-1987), and IHS President (1983-1986). He was elected an Honorary Member in 1998. Tributes to Jim appear in the October 2006 issue of The Horn Call, announcement of his election as an Honorary Member in the November 1998 issue, and a biography on the occasion of his retirement in the October 1987 issue. The James H. Winter Memorial Brass Scholarship has been established in his honor at California State University Fresno.